With layers of rich chocolate, salty-sweet peanuts and chewy nougat, this crowd-pleasing pie takes inspiration from one of our favourite childhood chocolate bars. Add a splash of bourbon to the caramel for a grown-up take. 1. For the caramel, gently heat the sugar, cream and butter, stirring until the sugar dissolves. Simmer briskly for 1 minute, take off the heat and leave to cool for 5 minutes. Stir, cover the surface with cling film and leave to cool completely. Set aside 4 tbsp in a small bowl for drizzling over the finished pie. 2. For the ganache, heat the cream in another pan with a pinch of salt until just before boiling. Take off the heat, stir in the chocolate until melted, then mix in the butter until smooth. at least 2 hours (or up to 24 hours, if making ahead). a sugar thermometer – about 4-5 minutes. Before the syrup reaches temperature, use electric beaters to whisk the egg whites with a pinch of salt in a large clean bowl. Once white and frothy, though not yet peaky, slowly pour the hot syrup into the egg whites, whisking all the time. Add the cream of tartar (or lemon juice) and beat for about 10-12 minutes until completely cool and very thick. 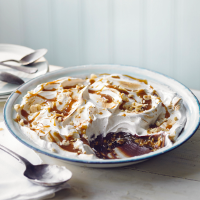 a kitchen blowtorch, then reheat the reserved 4 tbsp caramel until pourable. Drizzle over the top of the pie and scatter with the reserved 2 tbsp peanuts before serving.